How do you react to life is how you are able to adapt and adjust in certain situations. It also depends on your attitude towards yourself and also how your attitudes are towards others. How you treat yourself and others depends on your up-bringing and your surroundings. When was the last time you observed yourself reacting to something? Was it a good reaction or bad reaction to whatever the situation and circumstances were? Did you even notice how you reacted to this? Sometimes things happen, and you react in a way before ever really thinking about it. It’s human; we all do it. You never know whether what to say or do in the spur of the moment. It’s always best to consider options before blurting out something or doing something hurtful that may be regretted later, but how many of us actually do consider those options? Only the considerate do; only the intelligent, soulful people do. When things go from bad to worse, or if you are lucky, things go from good to awesome, you know whether to outweigh the results and then do something to either make it better, or make it even more greater than it was. 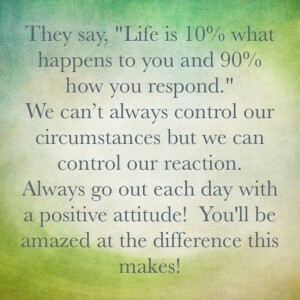 How do you react to life? If you were to do some things over again in life, would you want to make them better, or just let them be? Please comment and share if you like How Do You React To Life?